The Harry Potter film series may have concluded in 2011 with The Deathly Hallows – Part 2, but that didn’t mark the end of exploring J.K. Rowling’s Wizarding World on the big screen. Five years later, we turned the clock back to 1926 for Fantastic Beasts and Where to Find Them, the first of a five-movie spinoff series. Later this month, the second installment, Fantastic Beasts: The Crimes of Grindelwald, will work its magic in theaters, but reviews for the sequel are now coming in, and it doesn’t appear to measures up to its predecessor. 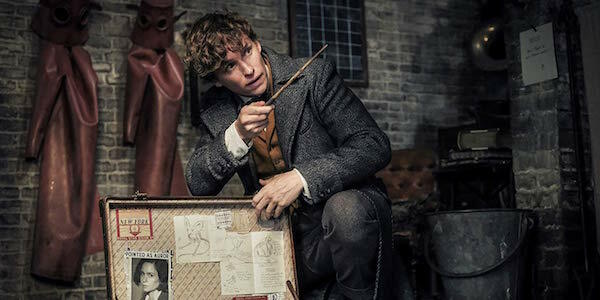 Starting off, CinemaBlend’s own Eric Eisenberg gave Fantastic Beasts: The Crimes of Grindelwald 3 out of 5 stars in his review, noting that while longtime fans of the Wizarding World franchise will get a lot out of the movie, those who are just casual fans/viewers of the Harry Potter and Fantastic Beasts movies will have difficulty being “deep end of the pool.” Those of you who have been looking forward to seeing Jude Law’s Albus Dumbledore and the first full appearance of Johnny Depp’s Gellert Grindelwald will also want to temper your expectations, as the former only has a “very minor part” in The Crimes of Grindelwald and Eric describe the latter as disappointing. Fantastic Beasts: The Crimes of Grindelwald is chapter two in a longer story that may look better once we see the rest—but, on its own, it fails to live up to its Harry Potter roots. IGN‘s David Griffin was much kinder towards Fantastic Beasts: The Crimes of Grindelwald, giving it an 8 out of 10 score in his review. In his opinion, The Crimes of Grindelwald was packed with “colorful new creatures, stunning visual effects, and enough intriguing storylines” for the next three installments, and characters like Gellert Grindelwald and Leta Lestrange, are enjoyable to watch, though David found Credence Barebone and Nagini “disappointing” and “unnecessary,” respectively. Fantastic Beasts: The Crimes of Grindelwald is another strong entry in J.K. Rowling’s Wizarding World saga. Rowling has improved upon the first Fantastic Beasts film by fleshing out her characters in a way that’s engaging, though not everybody receives as much attention. Both Johnny Depp and Eddie Redmayne are – forgive the pun – fantastic in their respective roles. Variety‘s Andrew Barker felt that while J.K. Rowling has done a great job with world building over the years, that’s only half of the equation, and Fantastic Beasts: The Crimes of Grindelwald fails to deliver on the other half, namely “real characters” and a compelling story. Instead, this sequel is described as the “noisiest, most rhythmless, and least coherent entry” in the Wizarding World, lacking tension and causing worry about if the rest of the Fantastic Beasts franchise is heading in a similar direction. Brian Truitt from USA Today, on the other hand, awarded Fantastic Beasts: The Crimes of Grindelwald 3 out of 4 stars, complementing the sequel for its solid cast and giving Wizarding World fans a “a darker and bolder film” that incorporates different eras of the mythology and provides a “more relevant cinematic villain” in Grindelwald than Voldemort was previously… (or will be, if we’re looking at this within the fictional universe’s timeline). That said, The Crimes of Grindelwald‘s ambition does threaten to derail the story at times. Finally, Indiewire‘s Kate Erbland stamped a C+ on Fantastic Beasts: The Crimes of Grindelwald, acknowledging that while the sequel “nudges” this franchise forward, there are too many storylines and characters taking away from what charms there are. New creatures and flashbacks to Newt Scamander’s time at Hogwarts are treats, but they don’t balance out those numerous issues. Overall, Fantastic Beasts: The Crimes of Grindelwald sounds like quite the mixed affair. Longtime Harry Potter fans will probably have better luck enjoying the movie compared to those who don’t keep up with this magical mythology, but it’s doubtful this will go on to be one of the more cherished entries in the Wizarding World. As mentioned earlier, this is also Part Two of a five-part saga, so it is concerning that there’s already a sense of exhaustion so early into the proceedings. As of this past June, J.K. Rowling was writing the Fantastic Beasts 3 script, and whether she’s finished with it or not, it will be interesting to learn if she makes any changes to that upcoming story based on the reception to Fantastic Beasts: The Crimes of Grindelwald. You can judge Fantastic Beasts: The Crimes of Grindelwald for yourself when it casts its spell in theaters on November 16. For those of you already looking even further into the future, Fantastic Beasts 3 is scheduled for November 20, 2020. You can also find out what this year’s other remaining movies are by scanning through our 2018 release schedule, or feel free to get a head start on next year by checking out our 2019 release schedule.